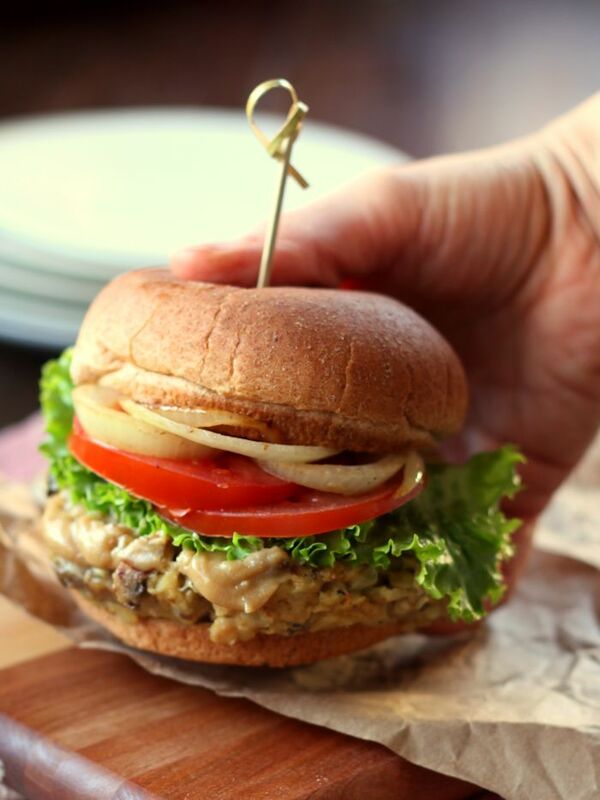 Thank goodness for veggie burgers. As much as I love to cook, I’d probably go hungry if veggie burgers hadn’t been invented by some wonderful genius of a person. 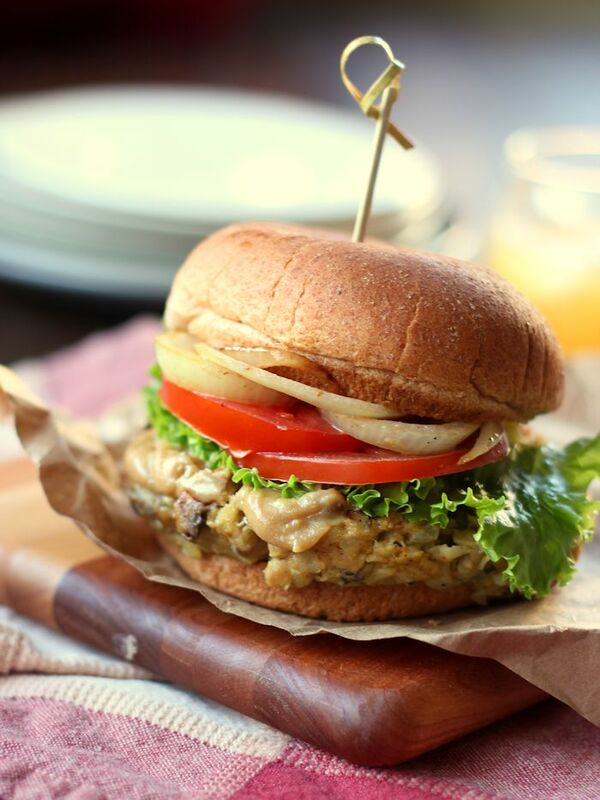 Store-bought veggie burgers are one thing, but in case you didn’t know, homemade veggie burgers are just as big a life saver as the frozen kind. In fact, homemade burgers are better, because you can do whatever you want with them and you can always make them vegan. I had it in my head for a while that I wanted to create a vegan analogue to my old favorite store-bought veggie burger, which was the Gardenburger Original. Those suckers were so good! 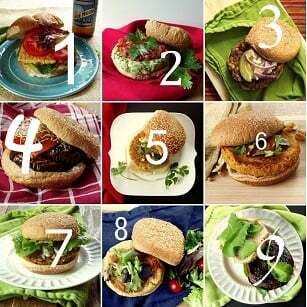 I was never a fan of veggie burgers intended to replicate meat, which Gardenburgers don’t do at all. So the other day I picked up a box at the supermarket and gave the ingredients a scan. Mushrooms, rice, cheese. I could totally swing this. So did I end up with something that accurately mimics my old favorite? Not exactly. See, just as I’m not into veggie burgers that taste like fake meat, I realized I’m not into vegan burgers that taste like fake cheese. I could’ve shoved some veggie shreds in there and probably ended up with something pretty darn close to my old favorite, but instead I went for vegan counterpart ingredients that were totally capable of standing on their own in terms of flavor and texture. Tahini, some nutritional yeast, a little white wine vinegar for tang. In the end I decided some thyme was needed, because savory herbs go so well with mushrooms. My mushroom burgers turned out great! In fact, I think this is the perfect burger for this time of year. It’s light enough to eat post holiday celebration and reasonably healthy, but packed with the savory flavor I crave during those chilly late autumn days. Also, if you happen to have some Thanksgiving leftovers still on hand, pile them on one of these patties. This one is begging for some cranberry sauce. Place brown rice and vegetable broth into a small saucepan and place over high heat. Bring to a boil, lower heat, cover and allow to simmer until rice is fully cooked and water is absorbed, 40-45 minutes. Remove from heat and allow to sit, covered, 5 minutes more. While rice cooks, coat the bottom of a large skillet with 2 tablespoons of olive oil and place over medium heat. Add onion and cook until softened, about 5 minutes. Push onions to the side of skillet and add mushrooms in an even layer. Allow to cook until tender and lightly browned, about 4 minutes, flip and cook until lightly browned on opposite sides, about 4 minutes more. Add garlic to skillet and flip everything a few times. Cook about 1 minute more and remove from heat. Place cooked rice, mushroom mixture, beans, panko breadcrumbs, tahini, nutritional yeast, vinegar, flax seeds, thyme, salt and pepper into food processor bowl. Pulse everything a few times to mix. Do not overblend. Mixture should be moist, but firm enough to shape into patties. Add a bit more panko if mixture seems too moist. Coat the bottom of a large skillet with a bit of olive oil and place over medium heat. Working in batches, shape mixture into patties and place in hot skillet, being careful not to overcrowd the skillet. Cook about 5 minutes on each side, until browned, lightly pressing down on the tops of patties, and then drawing the sides in with a spatula to help shape the patties during cooking. Whisk all ingredients together in a small bowl, thinning with as much water as needed to achieve desired consistency. Stuff patties into buns and top with toppings of choice. If you don't have a food processor or don't feel like busting one out, you can get away with mixing everything by hand. Be sure to chop the mushrooms very finely and mash the beans lightly with a fork or potato masher. The burgers will be a bit more crumbly when cooked, but I actually prefer it this way. your recipes continue to amaze me! I seriously could live off of veggies burgers if I wanted too! There are so many different varieties of them! These look especially delicious with the addition of “meaty” mushrooms! Oh my goodness. This was a fabulous recipe! It held together perfectly and the sauce!… Oh the sauce! 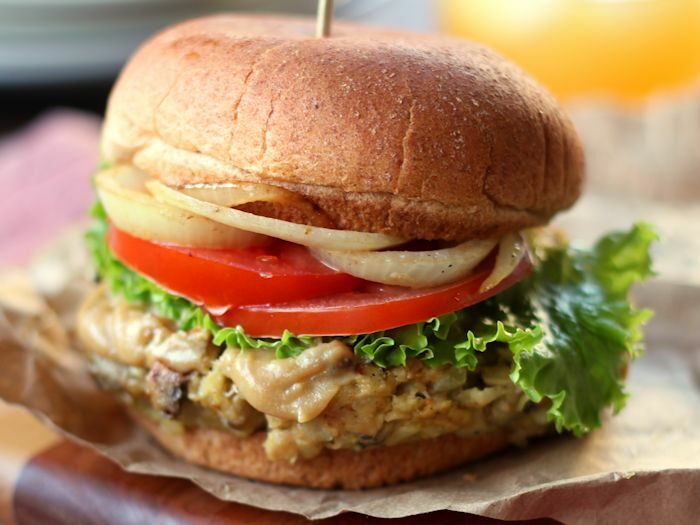 Thank you for posting such a delicious veggie burger recipe. Yay!! Glad you enjoyed them! !